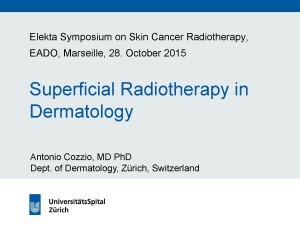 Prof. Dr. Jean Jacques Grob, Dr. Antonio Cozzio and Prof. Dr. Rafael Botella Estrada have kindly given the BrachyAcademy permission to record and post the presentations they gave at a satellite symposium entitled ‘New technologies in the treatment of melanoma and non-melanoma skin cancers’. 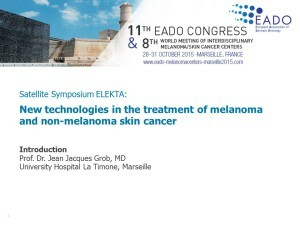 This satellite symposium was part of the 11th EADO Congress & 8th World Meeting of Interdisciplinary Melanoma/Skin Cancer Centers, which took place in Marseille, France, from October 28th to 31st 2015. 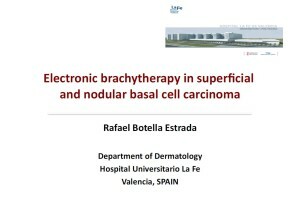 Disclaimer: Any views or opinions presented are by healthcare professionals who share their insights, recommendations and practical experience with respect to radiotherapy and brachytherapy, and do not necessarily represent those of Elekta. The information is not peer reviewed and should not be used to draw scientific medical conclusions or to base treatment decisions upon.